Picturing the Strategy for the Top End! I am so lucky in my job to be able to draw out ideas in great places with passionate people and drawing in the Top End is always a great experience! 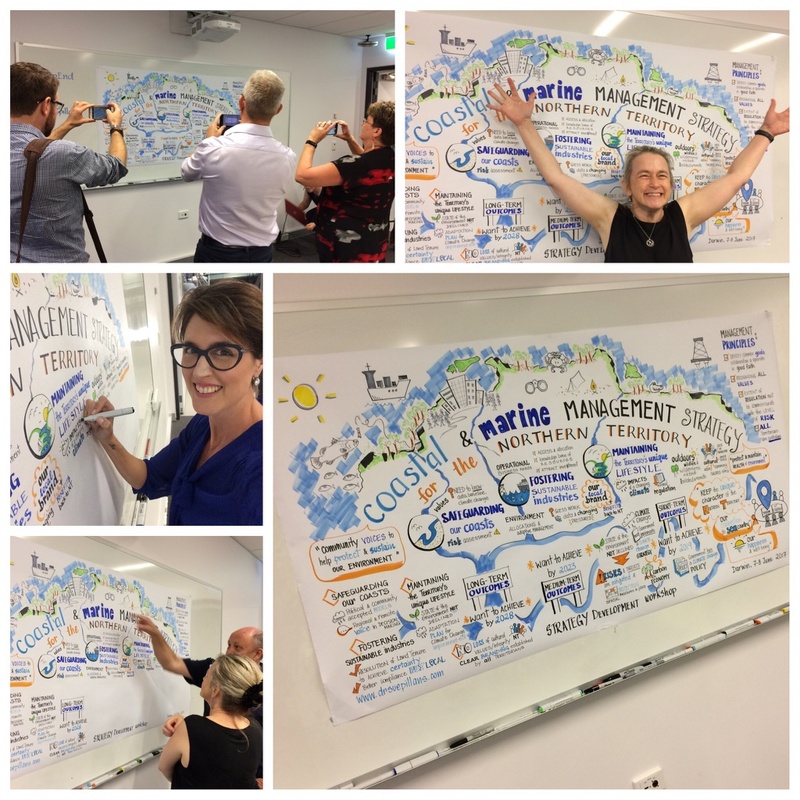 I was recently part of an experienced team of consultants engaged by the Northern Territory Government to help facilitate (and picture) stakeholder discussions to develop the Territory’s first Coastal and Marine Management Strategy. The Strategy will ensure the health and viability of the Top End’s coast and seas, support their use by Territorians for recreational and cultural purposes, manage growing demand for natural resources and foster sustainable industry. The development of this Strategy is a work-in-progress and it was a great privilege for me to picture these initial and important discussions with stakeholders. It is always a great feeling in my job to ‘sea’ how people react to and engage with my visuals and at this workshop I received the best feedback – that my visuals helped participants to ‘sea’ the journey they were on in developing this Strategy together. Visual storytelling is a powerful way of communicating and engaging with groups, stakeholders and clients so you can ALL ‘sea’ the big picture! A BIG thank you to Grahame Byron and Sue Sargent for inviting me to be part of this Exceptional Consulting Team! You can ‘sea’ more of my visual storytelling with Government groups, teams and organisations at my Graphic Recording. You can also dive in and follow my creative journey via my alter ego Dr Suzie Starfish and @suepillans on Twitter and Instagram. ← My story of words & pictures!